On Jan. 15, the Crestview FFA hosted State FFA Officer, Kolesen McCoy, to talk to students about many different things. Five Western Reserve Rangers 4-H club members were selected to serve on the 2019 Mahoning County Junior Fair Board. On Dec. 20, members of the Northwestern FFA participated in bell ringing at Walmart in Wooster. Catch up on local 4-H news from the Mahoning County Junior Fair Board and Just Rite 4-H Club. Catch up on FFA news from River Valley FFA and Fayetteville FFA. The Market Masters 4-H club wrapped up 2018 with a holiday potluck dinner and white elephant gift exchange Dec. 12. 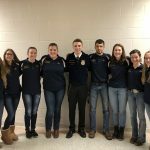 Catch up on local news from Waterford FFA, Utica FFA, Fayetteville FFA, Hillsdale FFA, West Branch FFA and Zane Trace FFA. 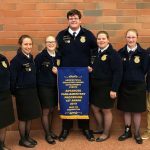 Catch up on local FFA news from Utica FFA, Southern Local FFA, Hillsdale FFA, Tri-Rivers FFA, West Holmes FFA, Northwestern FFA, Marlington FFA and more. Catch up on news from the Western Reserve Rangers 4-H Club and the Hicks and Hayseeds 4-H group. Catch up on local FFA news from River Valley FFA, United FFA, West Holmes FFA, Tri-Rivers Career Center FFA, Black River FFA, Crestview FFA and more.